Are you interested in studying cloud formations or moon phases? Urban ecosystems or wetland areas? The forest canopy or tidal pools? 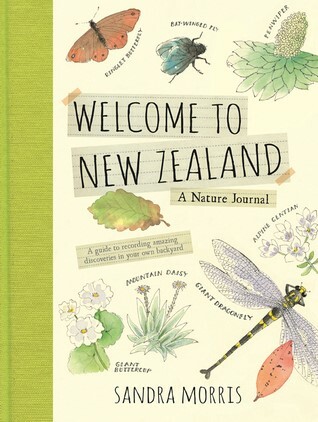 No matter your topic of study, Morris’ Welcome to New Zealand: A Nature Journal has inspiration for you. Written by Sandra Morris, teachers can use Morris’ 50-pages of simple line drawings and water color images to plan an entire unit of study. The Next Generation Science Standards (www.nextgenscience.org) emphasize the importance of using phenomena to engage students in learning. Phenomena are natural events that can be first observed and then predicted. A storyline is a coherent sequence of lessons, in which each step is driven by students’ questions that arise from their interactions with phenomena. Welcome to New Zealand provides countless opportunities for students to investigate natural phenomena and for teachers to create storylines to support them. What questions might students have about the images shown? Make sure questions ask information about how and why, not just about facts. What can students observe here that needs to be explained? How might teachers get students to buy into their questions (above) using these natural phenomena? What practices and skills can students use to investigate the phenomena? What practices and skills might they use to explain them? How might they apply this knowledge in familiar settings? What questions or ideas do they have for future investigations? Storybooks are a great way to capture children’s interest in the environment. Check out this book—and some ways to tie it to PLT activities.